Return to the index of 1963-68 Jeeps. Chris in Colorado Springs just bought a CJ-3B, to give him a complete set of flatfender CJs. He also dug up quite a bit of its history: "Originally Champagne with white wheels (70K JPEG), it had the same owner since 1977. He was the third owner and purchased it for $579.48 (200K JPEG). "I just purchased it, and hopefully I'm going to fully restore it and take his next-of-kin out for a ride after it's done. The Jeep is pretty much unmolested with the exception of a paint job from Champagne to silver. I picked up a front bench seat (180K JPEG) setup for it because it didn't come with any front seats -- the previous owner's son had thrown them away because all the upholstery was falling off. "I also was able to locate the second owner -- he used to drive this Jeep 20 miles a day from Gunnison CO to Blue Mesa Reservoir for work. He said it used to get down to negative 20 or 30 degrees (40K JPEG) but the Jeep always made it. He said his wife was very upset when he finally sold it! He's in his seventies and just couldn't be happier reminiscing about it. 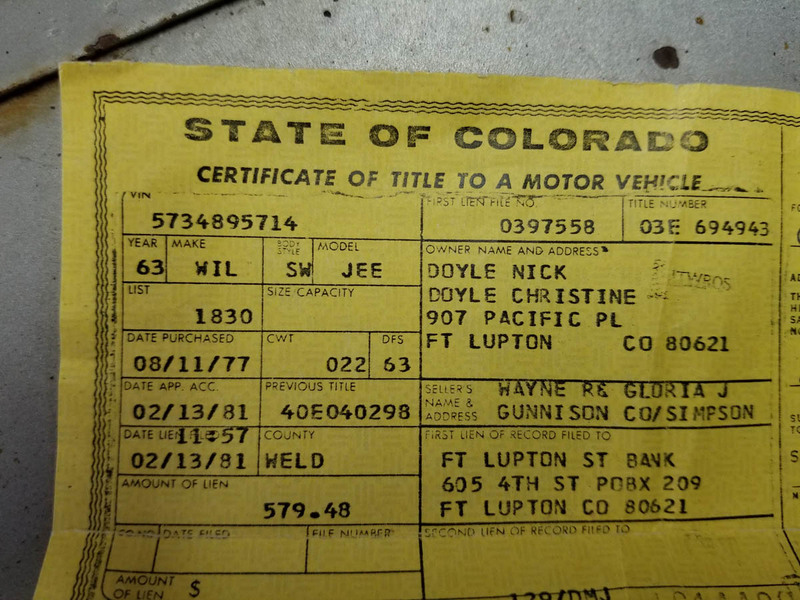 "He also let me know that he was the second owner, and purchased it in '71 from the original owner in Palisade CO where it was used to tow a trailer around the peach orchards while they were picking peaches." 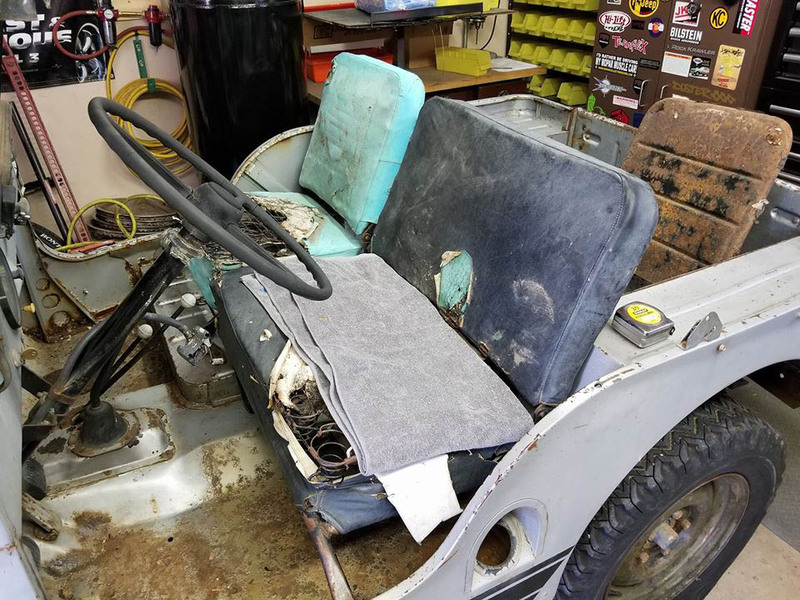 In October 2017 Chris reported, "The first step in a long process of restoring the CJ-3B has begun. The motor has been removed and sent off to the machine shop, hopefully to have it back in a few weeks. Then I will reassemble, reinstall and check out the rest of the drivetrain to see what condition it's in. Once everything's up and running and driveable I will tear it apart and clean and restore everything and do paint and body work." Alex wrote in 2008: "We just bought another Jeep this weekend. A '63 with 19,000 miles, and the best part is the attachments. A PTO winch on the rear and a snowblower on the front. Serial number 57348 97305. We are the third owners and it spent its life clearing a couple of farm yards and used for fishing in the summer by the two old farmers who owned it before us. Very rust free and well looked after, and mostly garaged. We found it on Manitoulin Island while we were vacationing, and bought it by phone when we came back to Montreal. What a final solution to my driveway." See more details in Meet Floyd. "My location is now Boise, Idaho. 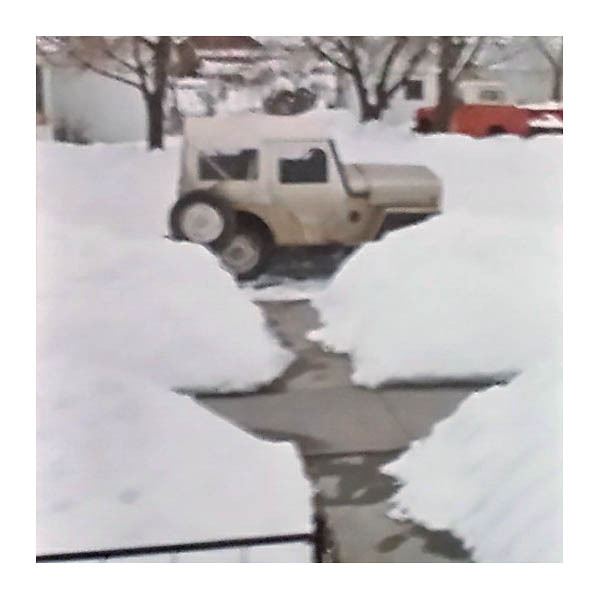 This Jeep was purchased in Denver in October 2005. The VIN tag was gone, and it didn't have the original engine or transmission. The paint and trim tag is there and reads: PAINT 228, TRIM 200. I found the number 112307 on the frame, so that fits as it is registered as a 1963. 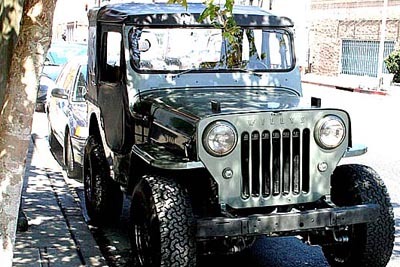 Also, there is no WILLYS stamping on the grille, tailgate or hood." See Late Model CJ-3B Restoration for photos of Doug's ongoing project. Engine no: (not sure, not too visible) 435C7 35032 (4 cylinder petrol)." The Jeep has been converted to right hand drive, and is nicely refinished in a metallic grey. 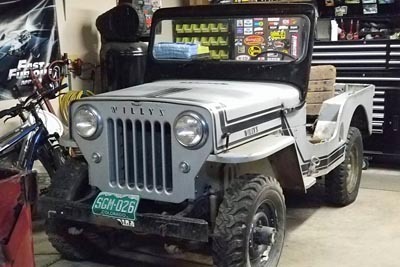 Glenn is in Maine, but bought this well-preserved 3B from Colorado to add to his Willys collection. See 2015 New Hampshire Trail Ride for some action shots. 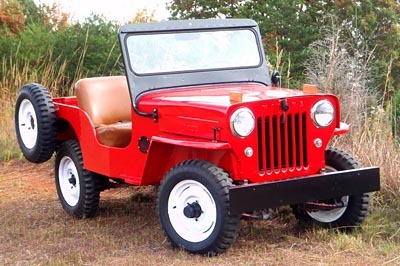 "I just purchased a October 1962-produced CJ-3B from a used Jeep dealer in Georgia, and had it shipped up to Edgewater MD (across the river from Annapolis MD). 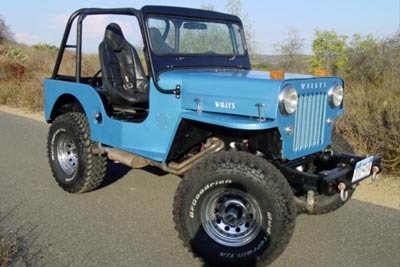 "The CJ-3B Page is excellent, and really helps a guy do a little research and understand the connection between what I am reading, and what I am seeing in the garage.The Jeep was sold to me as a 1962, but further research on the web page leads me to believe that the model year had shifted to 1963 in August, and mine was produced in October 1962, with VIN 57348 97907. The Jeep is only in fair condition, but it looks and runs fine. 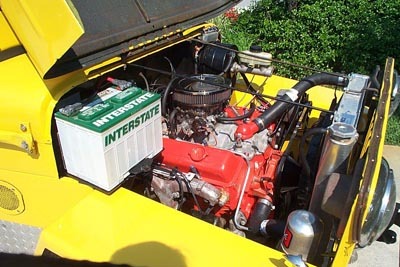 The stock engine was replaced with a Chevrolet V-8 283 from a 1966 Impala. "The 283 is rated at 195 hp, compared to the approx. 75 hp of the Hurricane engines, so I am going to stay vigilant for 'over-powered' problems. I was a Navy submarine officer and a nuclear engineer, and I like systems that 'work well together,' so this combination certainly raises questions. My regular car is a Toyota Prius, and that is a very-well-engineered car. 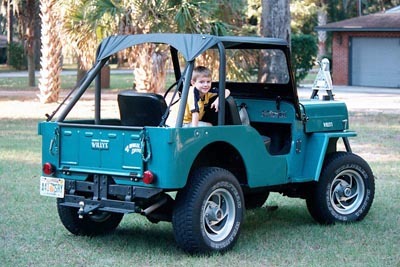 I will be curious to see how the Jeep reminds me of the cars of my youth (my early cars were from the 1960s). 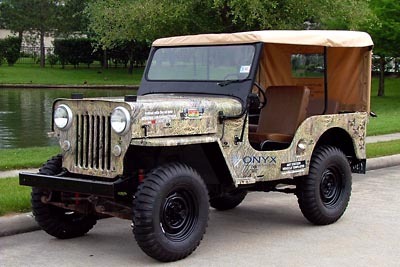 "I'm not a Jeep enthusiast that has to have an 'original' vehicle for restoration. I bought the Jeep to drive locally and enjoy the very cool nature of the 'small' jeep. 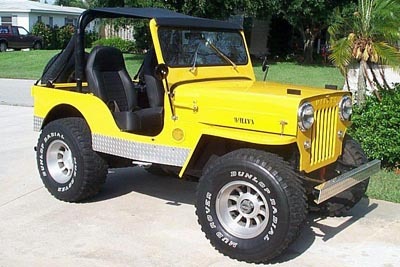 It will just be a nice Jeep to drive." "I've had it two years. I had to do a complete cosmetic restoration as the body was pretty rough. The floors, along with the rear inside fender wells, had all been replaced with 1/8 steel plate, so they weren't going anywhere. The fellow I bought it from rescued it from a hunting camp and had the engine rebuilt and a quick paint job put on it. It was his only car and he was traveling 60 miles and day back and forth to work in it and racked up 100,000 miles in four years on it. It is serial number 57348100161 and now resides in Jupiter, FL. It has a Chevy 350 in it now, and is a rocket with the 411's -- great beach cruiser." See also a rear view photo (70K JPEG). 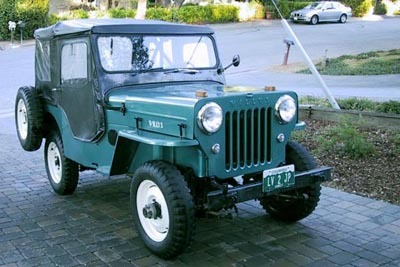 "I am in Butler, Pennsylvania, the home of the Bantam Jeep. 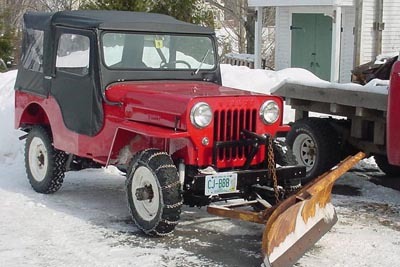 My '63 CJ-3B has been my plow Jeep for around 15 years, and it is the family rig now. Rust, age, reliability and safety became problems, and I added a tractor with a plow to my stable, so it was time to implement a plan.I took it down to the frame, cleaning or rebuilding just about everything." See more on Gerald's Family Rig. 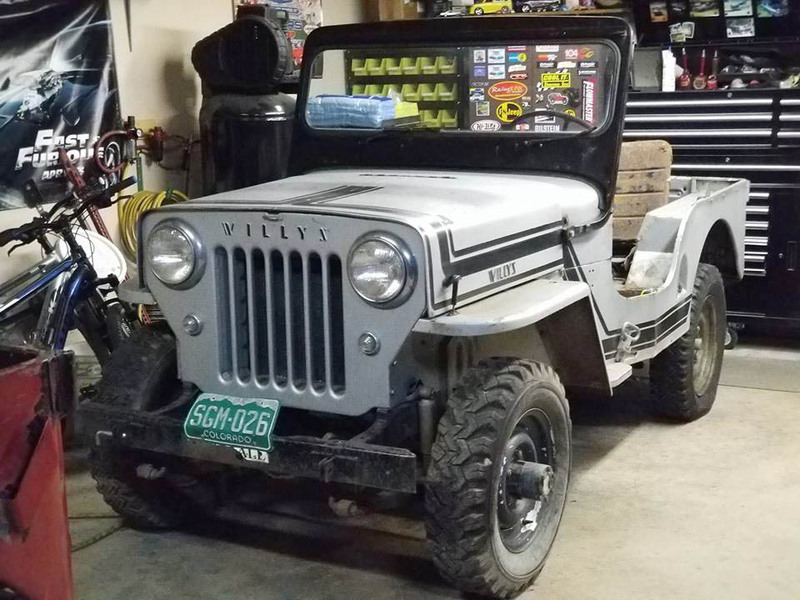 Mark "Goose" Dulken in North Carolina says, "I drove this Jeep as a teenager, and now 30-something years later it's back in my possession. 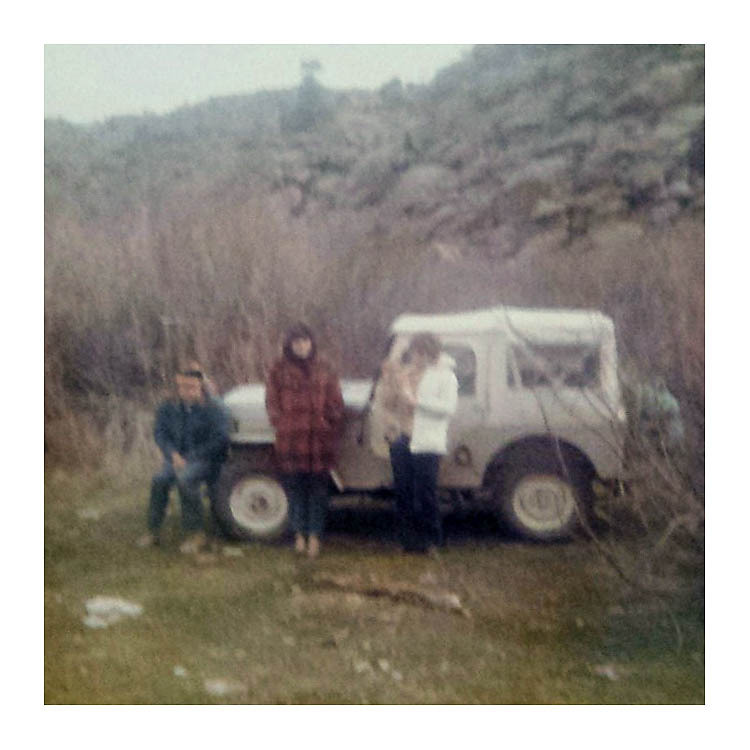 My dad ended up leaving me the old family Jeep that was my first vehicle back in high school." See Goose on the Loose for the story of Goose's 2-year restification project. "I have decided not to put the top back on. In reality, I will only drive it in dry weather and it is garage kept. I run with the windshield folded down most of the time anyway. No need for the top. " 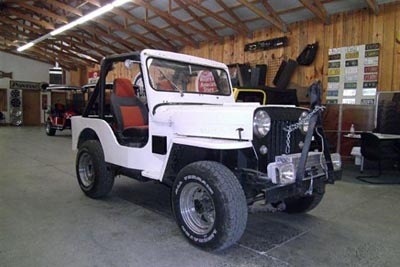 See New Life For an Old Dog for the story of Nick's body and paint job on this Jeep he bought from Dan Fedorko in 2005. "This is a 1963 3B that we got from my wife's dad when he passed away last year. 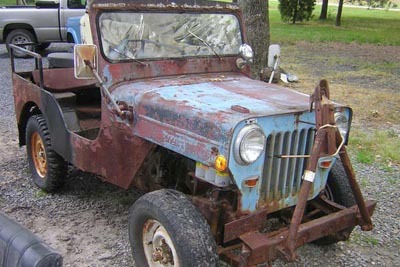 The Jeep had been used for a pasture rat for 20-something years, and had not seen pavement since he bought it. It had no brakes or lights, gen did not work, and it had a Pinto radiator with a 20-inch box fan case for a shroud. The exhaust was held together with Coke cans and lots of wire -- GRIM picture, huh? Well, the times are a-changing: since we got Willie here in Jourdantown, Texas, we have put on new brakes, everything but the pedal, new windshield and seal, new complete clutch kit, all new switches, 12-volt wipers. All four NOS springs I found at a little shop in San Antonio. A buddy took the original seats to Mexico and had them redone for 75.00 each -- what a deal. Found an orginal radiator and tires and wheels from guys on CJ3B.info. Took the original fuel tank off and repaired 8 holes and removed all 40 years of rust and crud from it. "We made a bikini top from fabric found at a yard sale (see a rear view photo, 180K JPEG.). My brother-in-law made a console for between the seats. Drained all fluids and flushed and refilled with fresh oils. Poor old Willie almost lost it when we greased him -- it was something new to him! 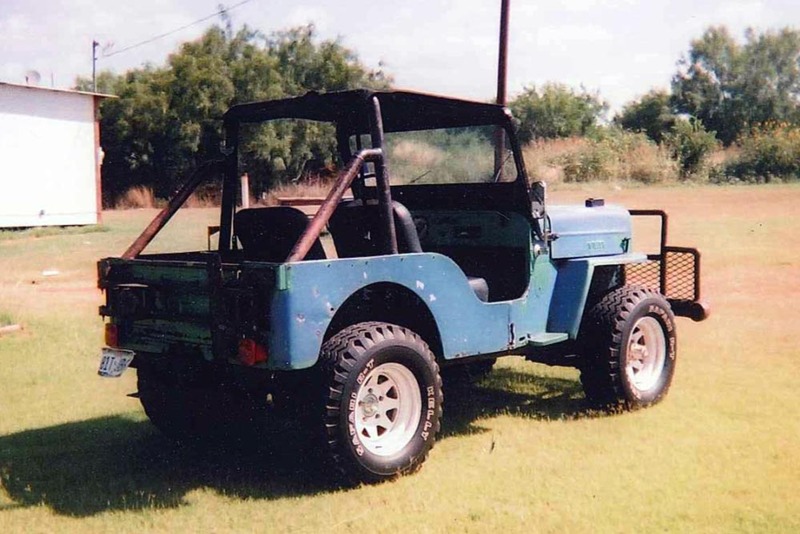 The bumper and rollbar were built by my father-in-law -- some may not like the bumper but it was his brakes! THE BUMPER STAYS. "This has been somewhat of a task as only my wife and me have worked on it -- guess we could have a lot worse vices. We drive it everywhere we go on the weekends, and every other chance we get. We still need to do some tub repair and paint in the future, but till then even old rundown 3bees are fun to drive -- haven't had this much fun in a truck in a long time." 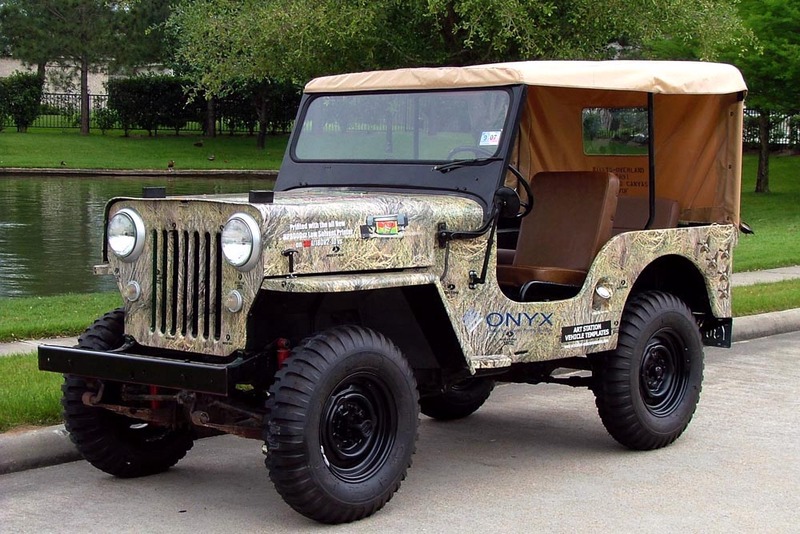 "Planning my first trip during the restoration of the Jeep was good motivation. 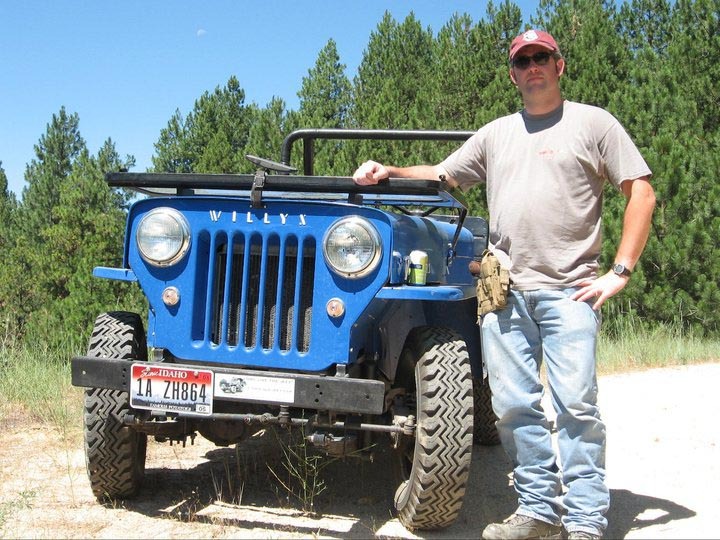 Simply put, I knew the country that I would be driving through was very remote, so restoring the Jeep to a high level of dependability would be very important." 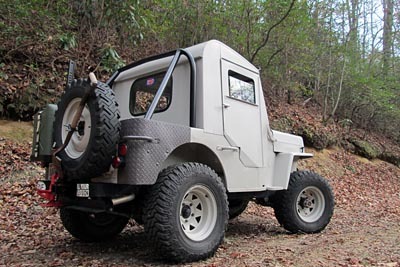 See more photos and details of the modifications and interesting history of Eric's Jeep, nicknamed The Smokejumper. 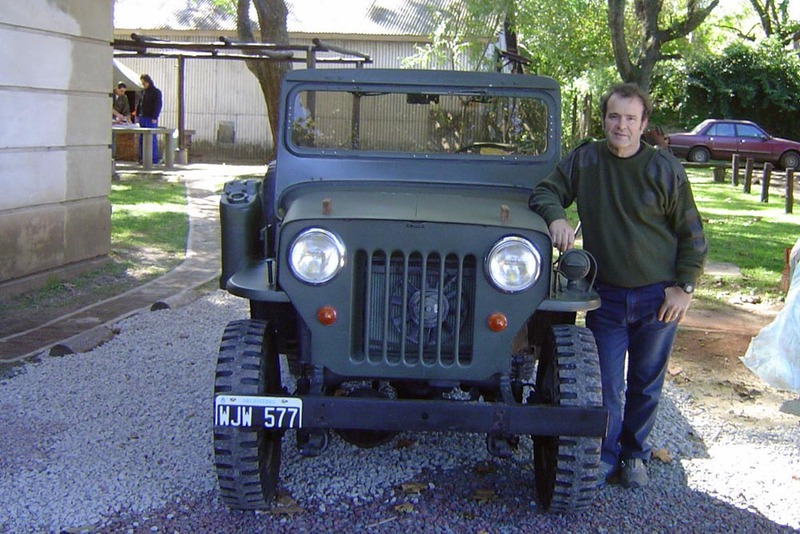 Argentina is home to probably the world's largest concentration of late-model M606 military Jeeps, mainly dating from 1966-67. But Nino Freire's is an earlier arrival, from late in the 1963 model year. Nino says, "I'm a new owner of a CJ-3B (M606) in Argentina, and my Jeep's serial number is 57348-114447, engine number 4J357591. Delivery date is 1964." 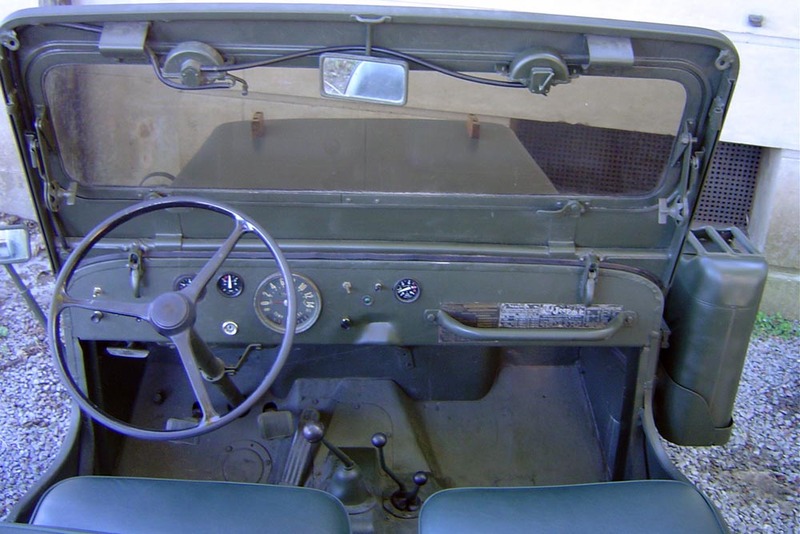 Thisn interior photo shows the speedometer marked up to 140 kilometers, the new parking brake and the Kaiser nomenclature plate as also found on other Argentinian military Jeeps. See also a front view photo (180K JPEG) showing the new electric fan. 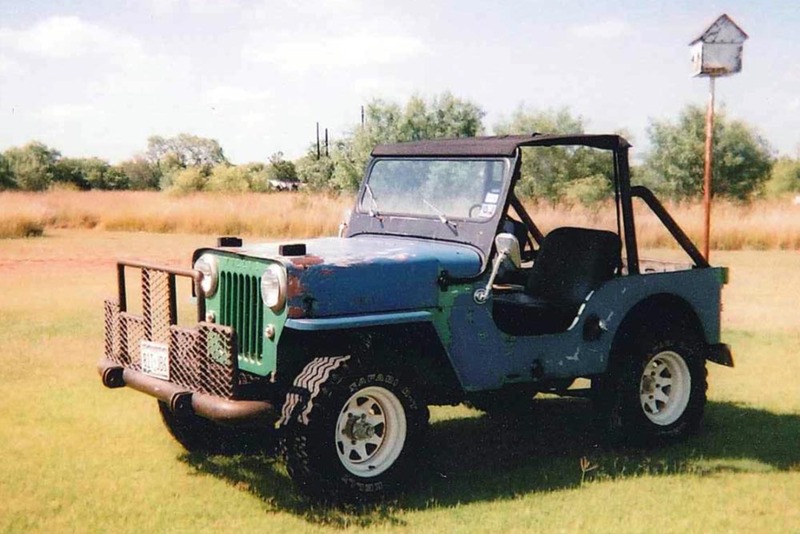 Jamie in Houston says, "About five months into the restoration of my 1963 CJ-3B Jeep, a friend asked me if I was going to paint it or wrap it. I sell graphic supplies and printers to the sign industry, so it was a logical question to ask a guy who pushes sticky-back vinyl for a living. Anyway, I agreed and after a lot of long nights and few false starts, my good friend and I wrapped my Jeep in vinyl. " See Wrapping a Jeep for more details and photos of Jamie's project. "I was told that this one was a 1964 model but according to the database it appears to be a '63. 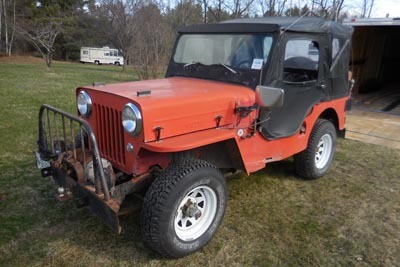 I saw this one sell to another Maryland Jeeper earlier this year (about the time I bought my '61). I posted a Want Ad on our local Jeep club board a few weeks ago and the new owner agreed to sell it to me. It had been sitting for several months but thanks to an electric fuel pump under the hood it fired right up. I drove it up onto my trailer with two flat tires (100K JPEG). I got it home, put two decent tires on the back and took it for a drive. It runs great but like my first one the body is in pretty bad condition (100K JPEG). Someone had replaced some body panels in the past but even those areas are crumbling. The purchase did net me several nice usable pieces as well as some interesting items that may or may not be aftermarket original dealer available equipment. Specifically, the spotlight (90K JPEG) and the mirror braces (60K JPEG). Probably just owner add-ons but seem to fit well. I'm going to save my pennies for a replacement tub. In the meantime I will tear it down and get the frame/driveline in good shape. Ed Surjan in Massachusetts bought this unique near-mint 3B from Adam Charnok in September 2002, and later sold it in 2009 to Michael Langner in Nebraska. 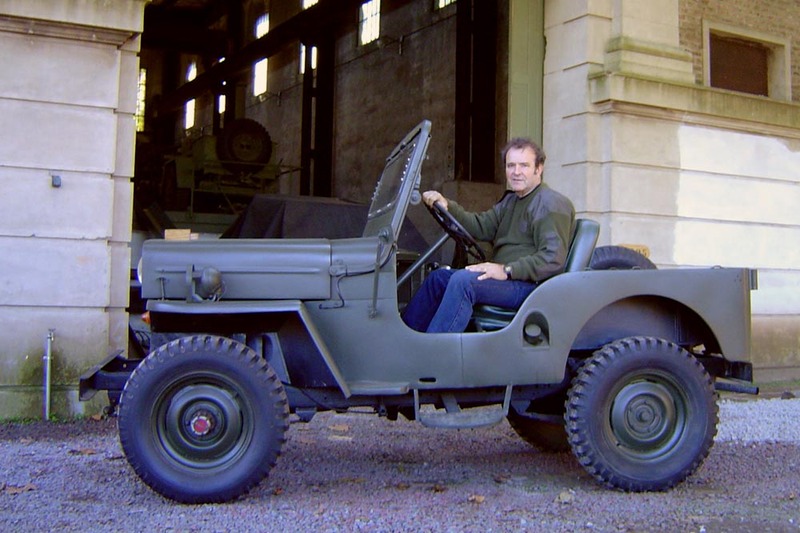 Ed nicknamed the Jeep "Woodchuck", and said, "Even just out on a pleasure drive Woodchuck always attracts a fair bit of attention, but most folks just presume it is another old restored military Jeep (the flat fenders and brown paint scheme must suggest military somehow). Jaws drop in stunned amazement once it becomes clear that this is an all-original civilian stock survivor." 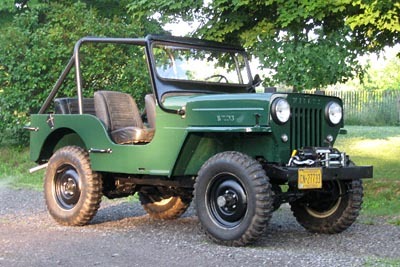 Ed took Woodchuck to the 35th Annual Rhinebeck NY Auto Show in 2005; see Mint '63 CJ-3B Wins Best in Class. See also Adam Charnok's photos of this Showroom Original 1963 CJ-3B, and Jim Allen's photos of the Original 1963 CJ-3B, Close-Up. 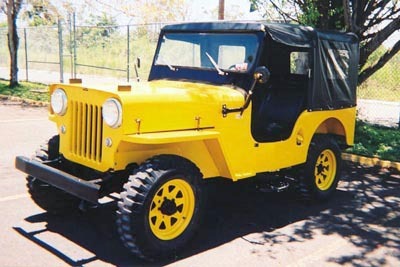 "I bought this Jeep from a farmer inside the island of Puerto Rico. The original color was a kind of a light green and I gave it a new paint job." See the original green (100K JPEG) which could be a 1963 Parkway Green or 1962 Jade Tint. The green is also visible on the interior as the body is sanded (70K JPEG). There is no VIN tag on the firewall, but the engine number 4J351088 suggests 1963. 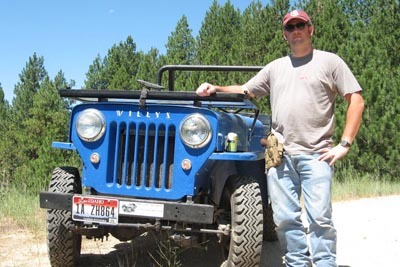 The lack of a "Willys" stamping on the tailgate (60K JPEG) indicates '62 or later. 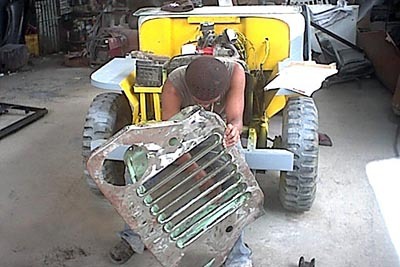 "Willys" can be seen stamped on the grille as Rene does some sanding, placing it as '63 at the latest. However there is no stamping on the hood, suggesting the hood may have been replaced at some point, or perhaps it was a very early recipient of an unmarked hood. "I acquired Bruiser from a good friend of mine in Colorado. 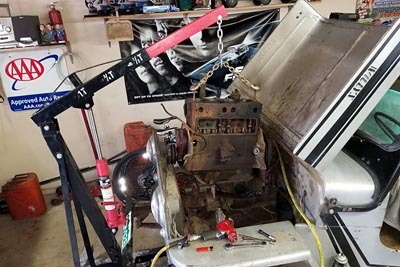 I planned on stripping everything apart and rebuilding it on a 1971 CJ-5 frame -- the old frame was pretty hacked up and bent. Mechanically, Bruiser is pretty stout. It runs on front and rear Dana 44's, a Chevy 350 mated to a T-18 and twin-sticked low-geared Dana 300 T-case. As with all my projects, I like to sit down and figure out what I want it to be. For me, Bruiser was going to be my ultimate 3B. I planned on doing the project right so I would have no regrets later on." 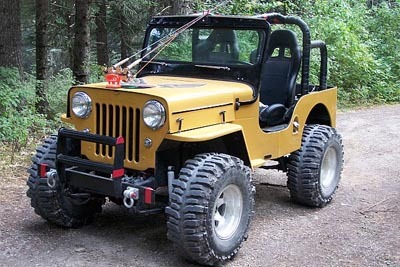 See articles on Bruiser's frame swap, Saginaw steering conversion and dual gas tanks, in CJ-3B Specs and Tech Tips. "The person I bought it from had the engine rebuilt, body and paint, new Bestop, new 15" wheels and expensive new tires (brand new and fancy but too wide for my tastes -- I like tall narrow tires on 16" rims. "I work in the intense Skid Row sector of Los Angeles, downtown east-central where the CJ-3B shall accompany me all the days it is running, as it is my only car. 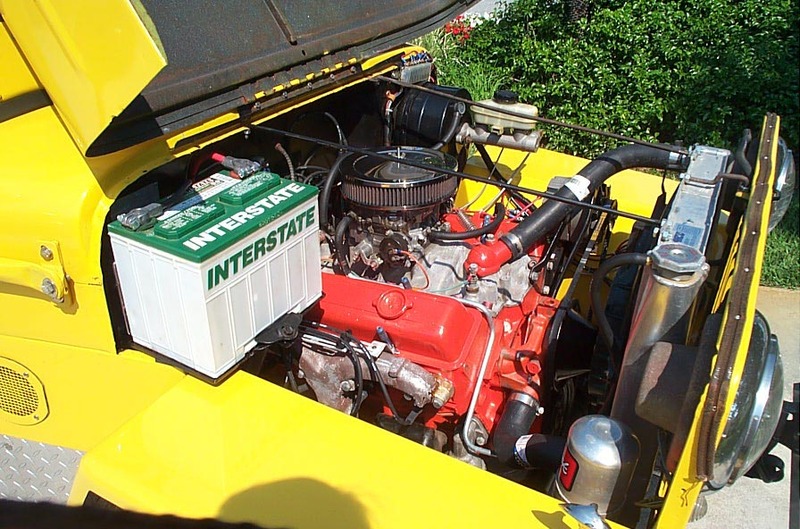 I really hope to be able to get a Warn or Saturn overdrive from Advance Adapters -- it's the only 'modification' I have ever preferred in my life, having once put one in a '55 Willys station wagon I owned." "I kept thinking I would have the Jeep painted before I took the photos, but it's been 2 years and it hasn't happened yet. My 1963 CJ-3B was purchased new in Fort Stockton TX by a rancher. The fellow I bought it from got it from this rancher in 1996. It has no significant rust and is basically a stock Jeep. It was in sad shape mechanically when I got it. 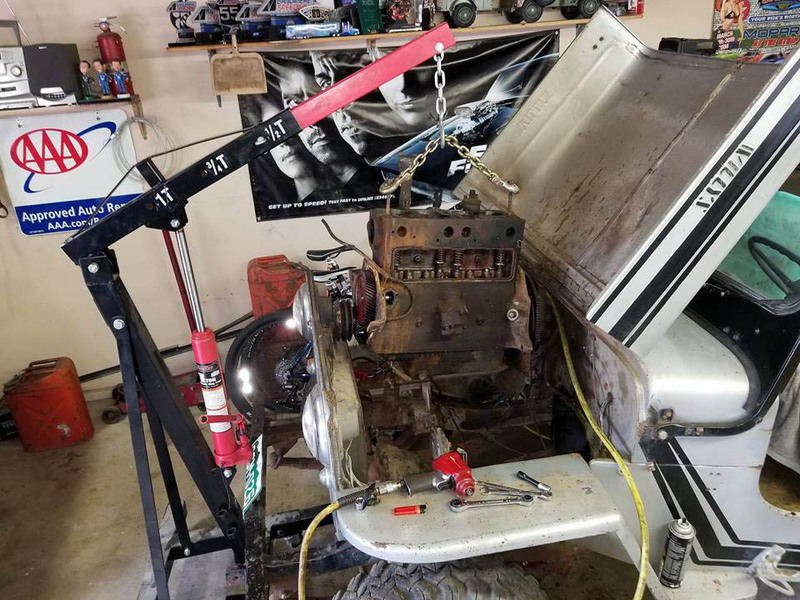 The engine would turn but not run, brakes were non-existent, it would not stay in 2nd or 3rd gear, and the transfer case had a bungee cord holding it in gear. And this was just what I could see from the trailer. 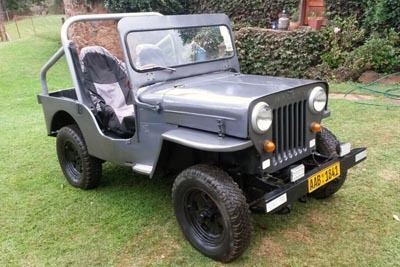 "I located the Jeep from a post on the CJ-3B Bulletin Board.My son and I had actually looked at the Jeep a few years earlier when we were looking for a Jeep for his first car. We were not interested in paying the price asked then, but I bought it for less than half the asking price 2 years later. We had already bought my son a Wrangler so I got to have this one. We have learned a lot and have done all the work so far, except the valve job. I still have the kingpins and one more time on the transmission (something rotten with the 2nd gear syncro) left to do. Serial number is 94106, it is licenced and inspected, and I found a set of 1963 Texas Farm Truck plates to use at the next registration." "I live in Brentwood, NH, about an hour north of Boston. 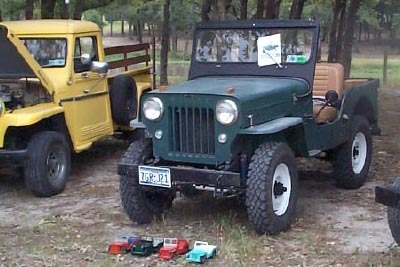 I currently own five Jeeps; a '58 FC-150, a '62 CJ-6, a '65 CJ-5, a '67 CJ-6 (V6) and of course, a '63 CJ-3B. The 3B was just a plow truck for a couple years, and this fall I decided to replace the body with a new steel one. "I rebuilt this motor about 2 years ago because the crank had broken. It broke at the rearmost connecting rod journal because of a material defect. It just occurred to me, looking at the AB in the engine number (4J343413AB) that the crank was turned down from the factory. Perhaps there were defects in this crank at the factory, and it took 40 years to finally break. When it broke it wasn't under load, just at idle, and fortunately the nature of the crack kept the two pieces together so nothing else was damaged. I snapped a photo of the broken crank piece (80K JPEG) although now it has some surface rust on it." "This is a '63 3B that I purchased outside of Cleveland, Ohio. The engine was locked up and the body was extremely poor (70K JPEG,) but this photo shows the complete restoration. It has an F-head and overdrive. The engine is not original, but the frame serial number matches the VIN tag. I put early-style seats in it due to the availability. 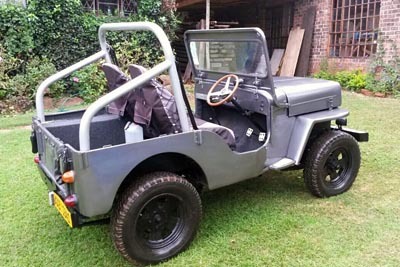 I got carried away with the restoration and ended up with too much money in it, but I have taken it off-road and it is a great performer. 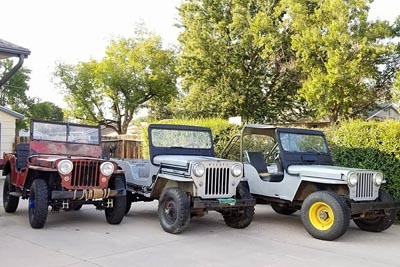 "I bought a rolling CJ-5 chassis with a 225 V6 today and it will be my next project -- I'm not sure what I'll use it for but it will probably involve a 3B." See also Brian's photo of the best way to remove a body (140K JPEG). 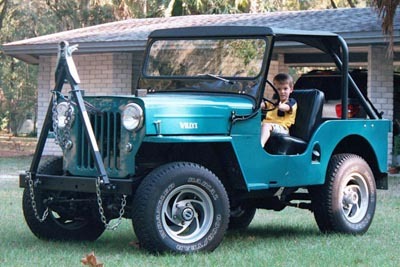 "I learned to drive in this Jeep. My grandfather bought it new and used it on his farm in south Georgia for about 15 years. 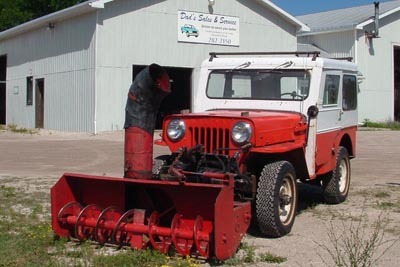 I spent many hours helping him clear roads through the wooded areas of his property with this and (I faintly remember) a Willys pickup. "When I stripped it out, I had the entire tub sprayed with pickup bed liner; this has worked great. The wheels were some a friend had. I'd like to find some good looking steel wheels to fit these tires. 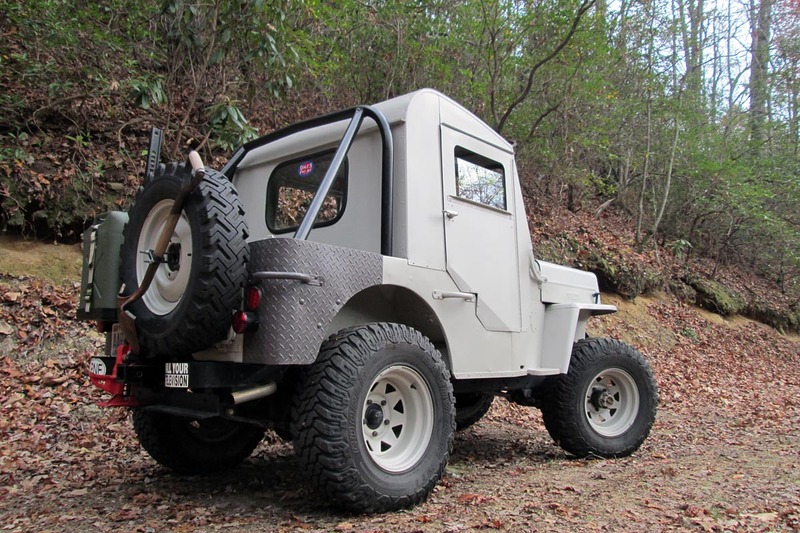 "Not shown in the photos are a set of canoe racks I made that attach to the front bumper (from the back side so the tow bar remains in place) and to the rear draw bar. We canoe area streams here in Florida that involve putting in at one point on the stream and taking out at another, often 10-25 miles away. This way we have two vehicles so that we can arrange a drop vehicle at the take-out point." 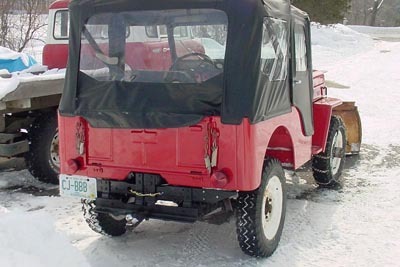 This rear view photo was a 2002 cover photo for CJ3B.info. "Joel Kamunen posted a listing for this Jeep on the CJ-3B Bulletin Board, and I bought it sight-unseen based on his recommendation. My gamble paid off -- it's wonderful. It has just over 32,000 original miles, and all it needs is a new set of tires and a little clutch work, and it'll be good as new." See also a rear view photo (60K JPEG) and a right side view (70K JPEG). 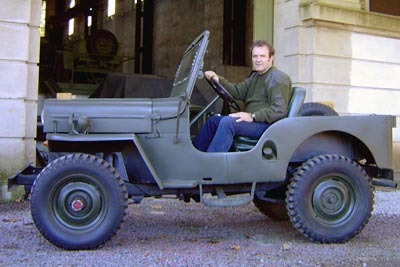 Note: John has now sold this Jeep.